There’s a fun, new update for Apple’s iMessage app that will probably make lots of power users happy. As long as you also have Google’s iOS app installed, you’ll be able to perform Google searches from within iMessage itself. It’s great to see these kinds of changes as the cellphone market continues to grow. When the iPhone first burst onto the scene, apps were few and far between. 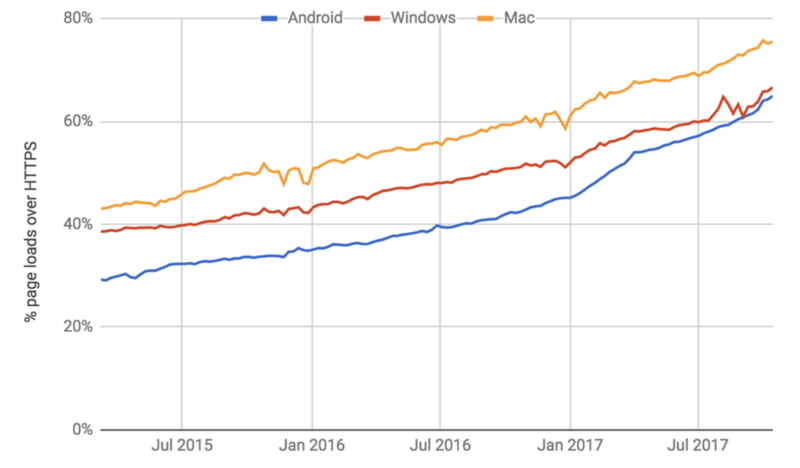 Now, not only are there untold thousands of apps on the market, but they are becoming increasingly integrated. That’s very good to see. When workflow management platform Asana announced a $75 million round of funding in January led by former Vice President Al Gore’s Generation Investment Management, the startup didn’t give much of an indication of what it planned to do with the money, or what it was that won over investors to a new $900 million valuation (a figure we’ve now confirmed with the company). Now, Asana is taking off the wraps on the next phase of its strategy. This week, the company announced a new feature it’s calling Timeline — composite, visual, and interactive maps of the various projects assigned to different people within a team, giving the group a wider view of all the work that needs to be completed, and how the projects fit together, mapped out in a timeline format. 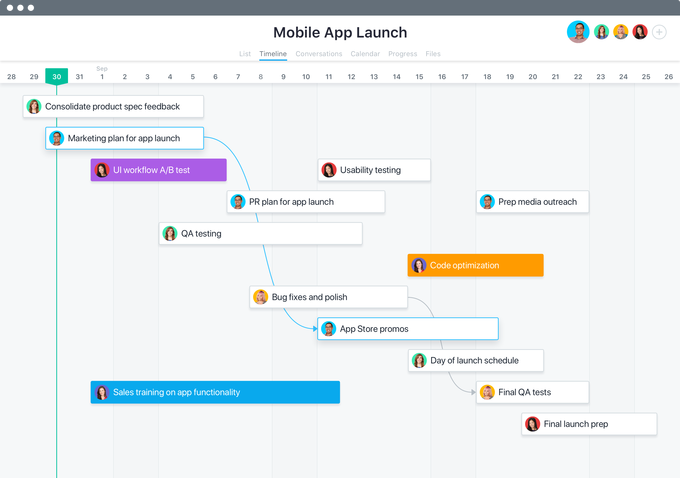 Timeline is a new premium product: Asana’s 35,000 paying customers will be able to access it for no extra charge. Those who are among Asana’s millions of free users will have to upgrade to the premium tier to access it. The Timeline that Asana is making is intended to be used in scenarios like product launches, marketing campaigns and event planning, and it’s not a matter of a new piece of software where you have to duplicate work, but each project automatically becomes a new segment on a team’s Timeline. Viewing projects through the Timeline allows users to identify if different segments are overlapping and adjust them accordingly. Perhaps one of the most interesting aspects of the Timeline, however, is that it’s the first instalment of a bigger strategy that Asana plans to tackle over the next year to supercharge and evolve its service, making it the go-to platform for helping keep you focused on work, when you’re at work. While Asana started out as a place where people go to manage the progress of projects, its ambition going forward is to become a platform that, with a machine-learning engine at the back end, will aim to manage a team’s and a company’s wider productivity and workload, regardless of whether they are actively in the Asana app or not. The bigger product — the name has not been revealed — will include a number of different features. Some that Rosenstein has let me see in preview include the ability for people to have conversations about specific projects — think messaging channels but less dynamic and more contained. And it seems that Asana also has designs to move into the area of employee monitoring: it has been working on a widget of sorts that installs on your computer and watches you work, with the aim of making you more efficient. “Asana becomes a team brain to keep everyone focused,” said Rosenstein. Given that Asana’s two co-founders, Dustin Moskovitz and Rosenstein, previously had close ties to Facebook — Moskovitz as a co-founder and Rosenstein as its early engineering lead — you might wonder if Timeline and the rest of its new company productivity engine might be bringing more social elements to the table (or desk, as the case may be). Rosenstein may have to his credit the creation of the “like” button and other iconic parts of the world’s biggest social network, but he has in more recent times become a very outspoken critic of the distracting effects of services like Facebook’s. It’s part of a bigger trend hitting Silicon Valley, where a number of leading players have, in a wave of mea culpa, turned against some of the bigger innovations particularly in social media. Asana, essentially, has taken the belief that social can become counterproductive when you have to get something done, and applied it to the enterprise environment. This is an interesting twist, given that one of the bigger themes in enterprise IT over the last several years has been how to turn business apps and software more “social” — tapping into some of the mechanics and popularity of social networking to encourage employees to collaborate and communicate more with each other even when (as is often the case) they are not in the same physical space. But social working might not be for everyone, all the time. Slack, the wildly popular workplace chat platform that interconnects users with each other and just about every enterprise and business app, is notable for producing “a gazillion notifications”, in Rosenstein’s words, leading to distraction from actually getting things done. The “team brain” role that Asana envisions may be all about boosting productivity by learning about you and reducing distraction — you will get alerts, but you (and presumably the brain) prioritise which ones you get, if any at all — but interestingly it has kept another feature characteristic of a lot of social networking services: amassing data about your activities and using that to optimise engagement. As Rosenstein described it, Asana will soon be able to track what you are working on, and how you work on it, to figure out your working patterns. The idea is that, by using machine learning algorithms, you can learn what a person does quickly, and what might take longer, to help plan that person’s tasks better, and ultimately make that person more productive. Eventually, the system will be able to suggest to you what you should be working on and when. All of that might sound like music to managers’ ears, but for some, employee monitoring programs sound a little alarming for how closely they monitor your every move. Given the recent wave of attention that social media services have had for all the data they collect, it will be interesting to see how enterprise services like this get adopted and viewed. It’s also not at all clear how these sorts of programs will sit in respect of new directives like GDPR in Europe, which put into place a new set of rules for how any provider of an internet service needs to inform users of how their data is used, and any data collecting needs to have a clear business purpose. Still, with a different aim in mind — helping you work better — the end could justify the means, not just for bosses, but for people who might feel overwhelmed with what is on their work plate every day. “When you come in in the morning, you might have a list [many things] to do today,” Rosenstein said. “We take over your desktop to show the one thing you need to do.” Checking your Instagram feed be damned. 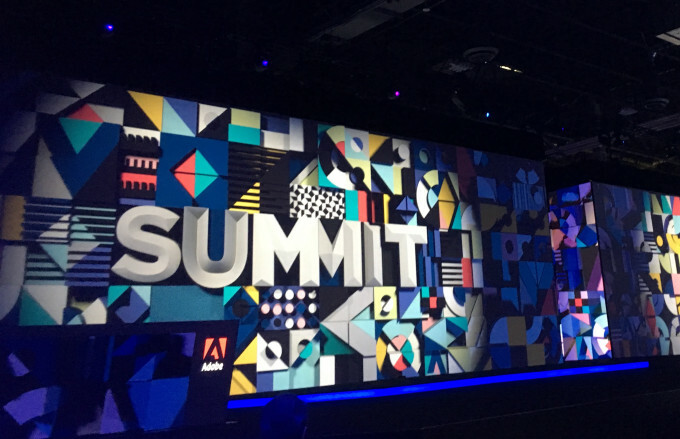 At the Adobe Summit in Las Vegas this week, privacy was on the minds of many people. It was no wonder with social media data abuse dominating the headlines, GDPR just around the corner, and Adobe announcing the concept of a centralized customer experience record. With so many high profile breaches in recent years, putting your customer data in a central record-keeping system would seem to be a dangerous proposition, yet Adobe sees so many positives for marketers, it likely believes this to be a worthy trade-off. Which is not to say that the company doesn’t see the risks. 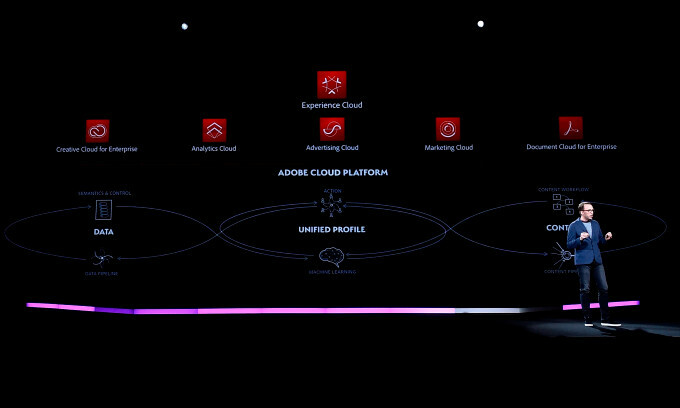 Executives speaking at the conference continually insisted that privacy is always part of the conversation at Adobe as they build tools — and they have built in security and privacy safeguards into the customer experience record. Ben Kepes, an independent analyst says this kind of data collection does raise ethical questions about how to use it. “This new central repository of data about individuals is going to be incredibly attractive to Adobe’s customers. The company is doing what big brands and corporations ask for. But in these post-Cambridge Analytica days, I wonder how much of a moral obligation Adobe and the other vendors have to ensure their tools are used for good purposes,” Kepes asked. It’s worth pointing out that the goal of this exercise isn’t simply to collect data for data’s sake. It’s to offer consumers a more customized and streamlined experience. How does that work? There was a demo in the keynote illustrating a woman’s experience with a hotel brand. The mythical woman started a reservation for a trip to New York City, got distracted in the middle and was later “reminded” to return to it via Facebook ad. She completed the reservation and was later issued a digital key to her room, allowing her to bypass the front desk check-in process. Further, there was a personal greeting on the television in her room with a custom message and suggestions for entertainment based on her known preferences. As one journalist pointed out in the press event, this level of detail from the hotel is not something that would thrill him (beyond the electronic check-in). Yet there doesn’t seem to be a way to opt out of that data (unless you live in the EU and will be subject to GDPR rules). As it turns out, that reporter wasn’t alone. According to a survey conducted last year by The Economist Intelligence Unit in conjunction with ForgeRock, an identity management company, consumers are not just willing sheep that tech companies may think we are. The survey was conducted last October with 1,629 consumers participating from eight countries including Australia, China, France, Germany, Japan, South Korea, the UK and the US. 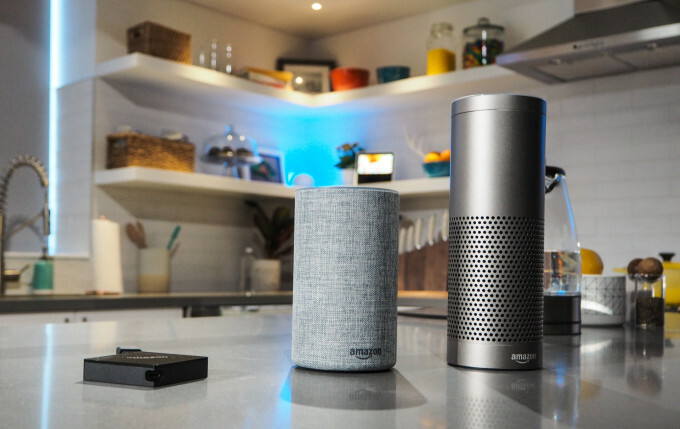 It’s worth noting that survey questions were asked in the context of Internet of Things data, but it seems that the results could be more broadly applied to any types of data collection activities by brands. 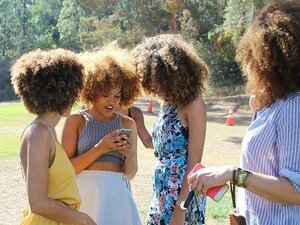 There are a couple of interesting data points that perhaps brands should heed as they collect customer data in the fashion outlined by Adobe. In particular as it relates to what Adobe and other marketing software companies are trying to do to build a central customer profile, when asked to rate the statement, “I am uncomfortable with companies building a “profile” of me to predict my consumer behaviour,” 39 percent strongly agreed with that statement. Another 35 percent somewhat agreed. That would suggest that consumers aren’t necessarily thrilled with this idea. 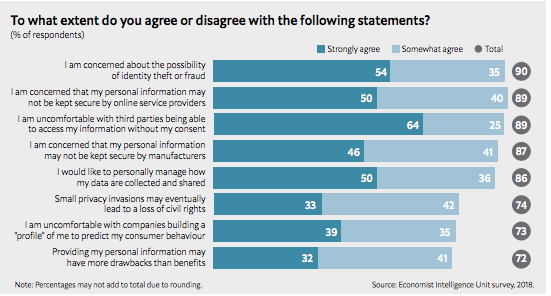 When presented with the statement, Providing my personal information may have more drawbacks than benefits, 32 percent strongly agreed and 41 percent somewhat agreed. That would suggest that it is on the brand to make it clearer to consumers that they are collecting that data to provide a better overall experience, because it appears that consumers who answered this survey are not necessarily making that connection. Perhaps it wasn’t a coincidence that at a press conference after the Day One keynote announcing the unified customer experience record, many questions from analysts and journalists focused on notions of privacy. If Adobe is helping companies gather and organize customer data, what role do they have in how their customers’ use that data, what role does the brand have and how much control should consumers have over their own data? These are questions we seem to be answering on the fly. The technology is here now or very soon will be, and wherever the data comes from, whether the web, mobile devices or the Internet of Things, we need to get a grip on the privacy implications — and we need to do it quickly. If consumers want more control as this survey suggests, maybe it’s time for companies to give it to them. In September 2017, we announced a new module – Deep Visibility – to search for Indicators of Compromise (IoCs) and hunt threats. The feedback from our early adopters has been very positive and we would like to share some thoughts on how Deep Visibility saves time. The combination of EPP and EDR in a singular, purpose-built agent results in significant time savings from deployment, management, and capability standpoint. DV collects and streams the information for agents into the SentinelOne Management Console. The protocol uses compression and optimization to reduce bandwidth costs. More importantly, the information is available for threat hunting even when a compromised device is not. DV is also available on all platforms – Windows, Mac and Linux. 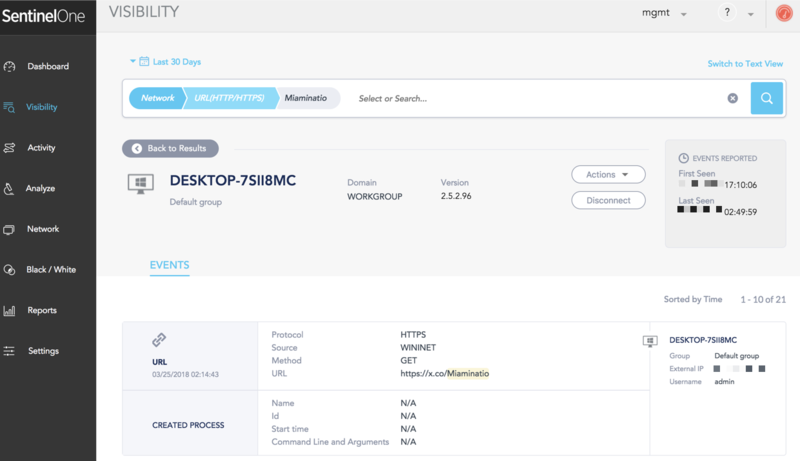 Many customers who were previously using osquery for threat hunting on Linux are now switching to DV as it provides cross-platform support with better manageability and user interface. By offering a single pane view into IoCs and equivalent capabilities on all platforms, DV saves time for our customers – they do not have to deploy different tools for different platforms. You save time and money by not having to deploy additional third-party hardware or certificates. 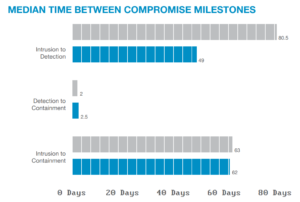 The 2017 Trustwave Global Security report claims an average dwell time of 49 days. Deep Visibility data is kept indexed and available for search for 90 days to cover even such an extended time period. After 90 days, the data is retired from the indices, but stored for 12 months. 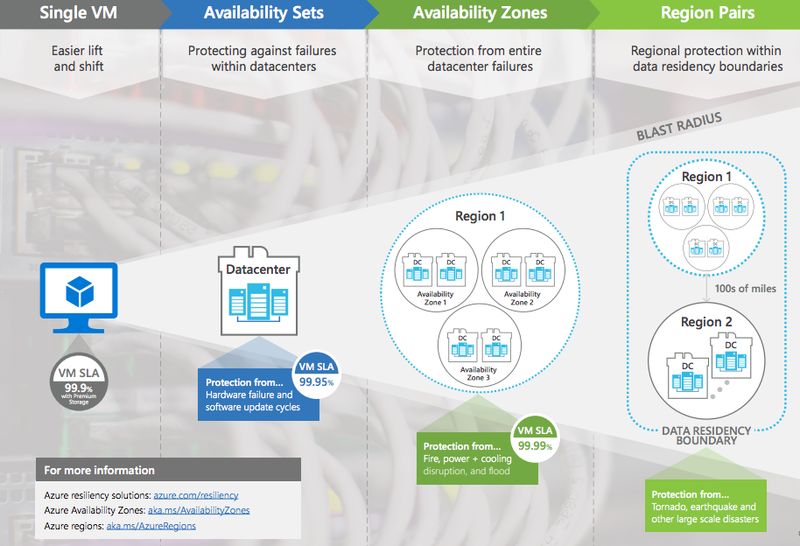 It is also available for customers to export into their own security tools and data lakes. We’re proud to offer our customers such a lengthy repository to enable maximum forensic value of the module. With other tools that offer shorter retention periods, you would have to re-load older data from your repository (if you have one) or re-construct the data using forensics tools like EnCase or eCat. The data collected by Deep Visibility can also be used for meeting file integrity needs, as every file change is tracked. We will soon be introducing a watchlist that alerts you whenever a file is modified by an unauthorized user. We save you the hassle of deploying a File Integrity tool like Tripwire. I close by inviting our customers and security professionals to try Deep Visibility. We look forward to working with you to make the world a safer place – and giving you industry-first real-time visibility of this commitment in the modules and features we constantly ship. We will be hosting a webinar on Deep Visibility on the 5th of April at 10am PT. This will feature Jim Jaeger, former Director of Operations at the NSA, as well as a demo on SentinelOne’s Deep Visibility capabilities. Register here. 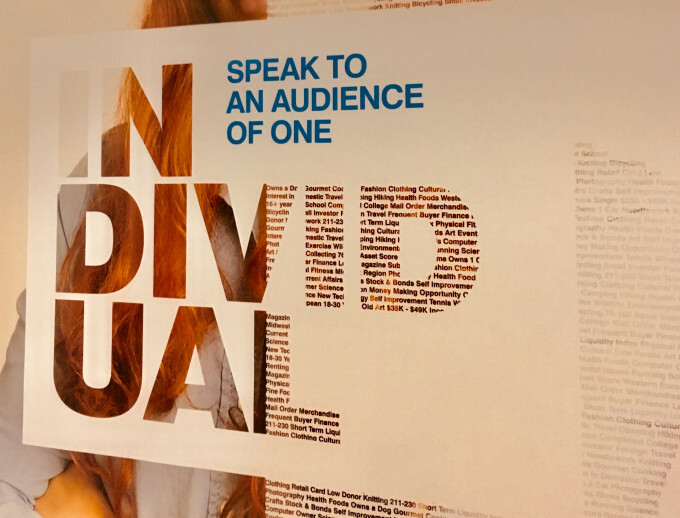 The post How Deep Visibility Saves You Time appeared first on SentinelOne. 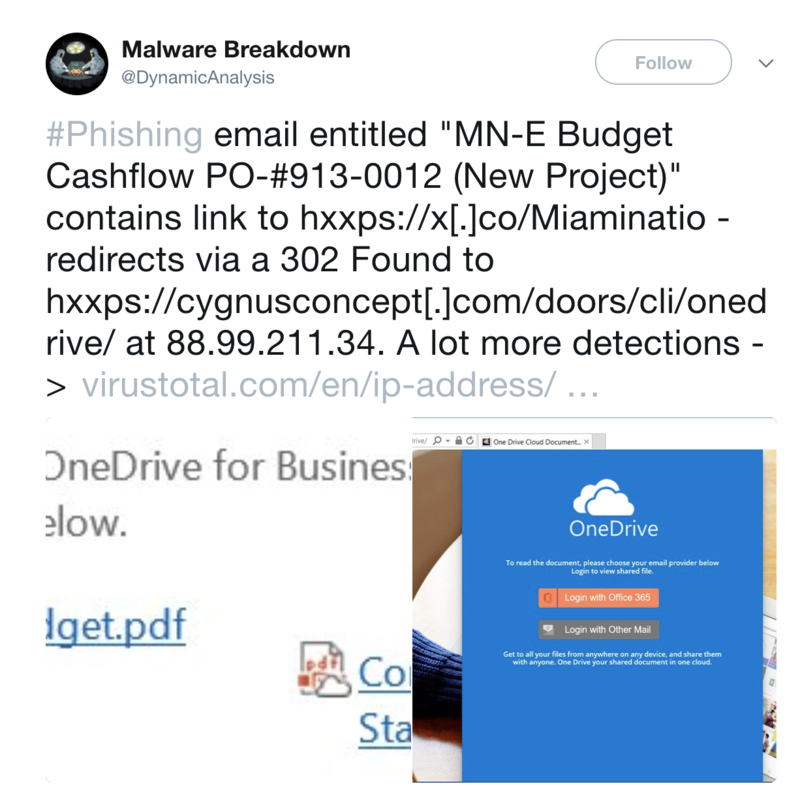 Despite being one of the oldest tricks on the web, phishing continues to be a significant problem for organizations. Your users are your assets, but also part of the security problem. 66% of the enterprises experienced ransomware originating from either a phishing, email or social networks. 44% of the undertakings experienced from Drive-by-download caused by clicking on a compromised website. Phishing sites are trying to trick users into entering credentials, personal information, and so on. For this, they want to avoid the “not secured” indication. SentinelOne will automatically mitigate malicious attempts incident by incident, while Deep Visibility will get to the root of these. By looking into the encrypted traffic, you can see as no other solution can, the chain of events leading to the compromise attempts are revealed. In the following video, you can see how to identify phishing attempts on your users. Now, you might want to look if there is any evidence of this campaign inside your network. A simple search would show you 21 entries of this encrypted URL. SentinelOne Deep visibility is a simple way to have visibility on your assets, including the increasing blind spots of encrypted traffic. It will allow your team to understand better the security incidents, monitor phishing attempts on your users, identity data leakage ensure cross assets and all these is a simple and straightforward interface that allows you to automate and connect it to other products on your portfolio. We will be hosting a webinar on Deep Visibility on the 5th of April at 10am PT. This will feature Jim Jaeger, former Director of Operations at the NSA, as well as a demo on SentinelOne’s Deep Visibility capabilities. Register here. The post How Deep Visibility helps you against Phishing appeared first on SentinelOne. Last time (part 1, part 2)we demonstrated several different methods for injecting 64-bit modules into WoW64 processes. This post will pick up where we left off and describe how the ability to execute 64-bit code in such processes can be leveraged to hook native x64 APIs. To accomplish this task, the injected DLL must host a hooking engine capable of operating in the native region of a WoW64 process. Unfortunately, none of the hooking engines we inspected can manage this out-of-the-box, so we were forced into modifying one of them in order to make it suit our needs. Support inline hooking of x64 functions. Open-sourced and free-licensed – so that we could modify it legally. Preferably, the hooking engine should be relatively minimal so as to require as few modifications as possible. After taking all of these requirements into consideration, we chose MinHook as our go-to engine. What eventually tipped the scales in favor of it was its small codebase, making it relatively easy to use in a PoC. All of the modifications presented later were done on top of it, and might be slightly different if another hooking engine is used instead. The complete source code of our modified hooking engine is available here. In part 1 we briefly mentioned that not any 64-bit module can be easily loaded into a WoW64 process. Most DLLs tend to use (both implicitly and explicitly) various functions found in common Win32 subsystem DLLs, such as kernel32.dll, user32.dll, etc. However, the 64-bit versions of these modules are not loaded by default into WoW64 processes, as they are not required for the WoW64 subsystem to operate. Furthermore, due to some limitations imposed by the address space layout, forcing the process to load any of these is somewhat difficult and unreliable. To avoid unnecessary complications, we chose to modify our hooking engine and the DLL that hosts it so that they would only rely on native 64-bit modules found normally in WoW64 processes. Basically, this left us with just the native NTDLL, as the DLLs comprising the WoW64 environment don’t usually contain functions which are beneficial to us. The first and most noticeable effect that this change raises is that higher-level Win32 API functions are not available at our disposal and would have to be re-implemented using their NTDLL counterparts. As demonstrated in figure 20, for every Win32 API used by MinHook, we introduced a replacement function which has the same public interface and implements the same core functionality, while internally using only NTDLL facilities. 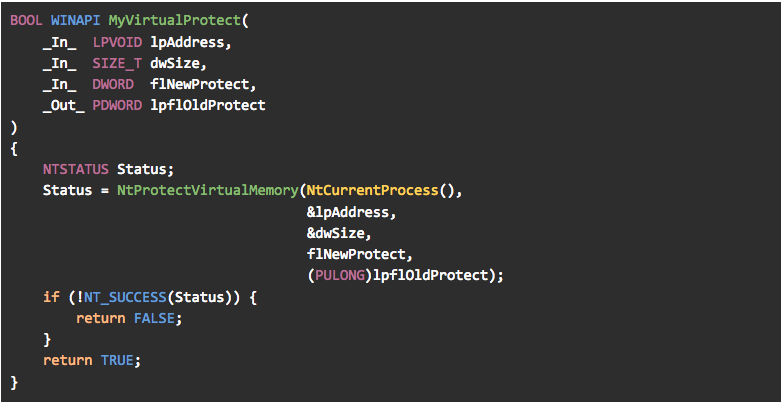 Most of the time these “translations” were rather straightforward (for example calls to VirtualProtect() can be replaced almost directly with calls to NtProtectVirtualMemory()). In other, more complex cases the mapping between the Win32 API functions and their native counterparts is not as clear, so we had to resort to some reverse engineering or peeking inside the ReactOS sources. The entry point must be explicitly specified as DllMain since DllMainCRTStartup is not linked in. 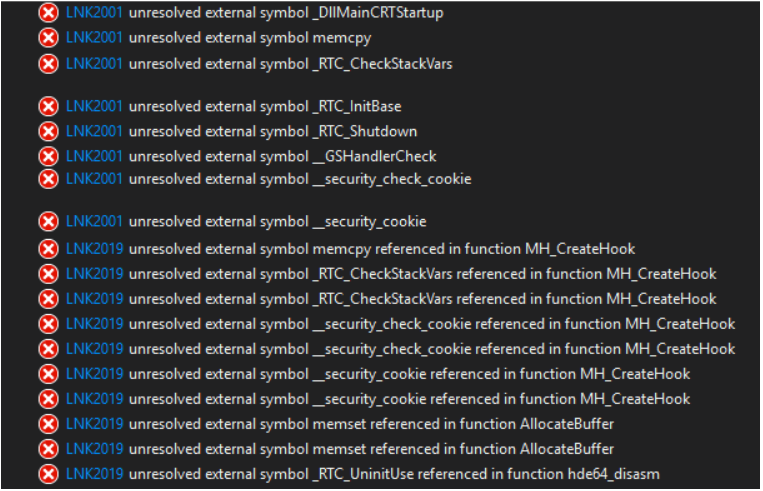 Additionally, memcpy() and memset() have to be implemented manually, or replaced with calls to RtlCopyMemory() and RtlFillMemory() exported from NTDLL. Allocate a “trampoline” in the process’ address-space and copy into it the prolog of the function that will eventually be hooked. Place a JMP instruction in the trampoline, right after the copied prolog. This JMP should point back to the instruction following the prolog of the original function. Place another JMP instruction in the trampoline, right before the copied prolog. This JMP should point into a detour function (usually found in the DLL we previously injected into the process). Overwrite the hooked function prolog with a JMP instruction pointing to the trampoline. Figure 23.1 – a general illustration of what an inline hook looks like. Figure 23.2 – a view of the trampoline. Marked in red is the jump to the detour function, and marked in green are the instructions copied from the hooked function and the jump back into it. This hooking method works by modifying the prolog of the hooked function, so whenever it is called by the application, the detour function will be called instead. The detour function can then execute any code before, after or instead of the original function. The jump from the hooked function to the trampoline is a relative jump encoded as “E9 ”. Since this instruction operates on a DWORD-sized operand, the trampoline must be at a distance of no more than 2GB away from the hooked function. This form of jump is usually chosen for this step since it only takes up 5 bytes and so it’s compact enough to fit neatly inside the function’s prolog. The jumps from the trampoline into the detour function and back to the hooked function, shown in figure 23.2, are indirect, RIP-relative jumps encoded as “FF25 ” (mnemonic form: JMP qword ptr [rip+offset]). This instruction will jump into a 64-bit absolute address stored in the location pointed to by RIP plus the offset. When running in native 64-bit processes, hooking engines employing this technique work just fine. As can be expected, the trampoline is allocated a short distance from the target function (up to 2GB away), thus allowing for successful binary instrumentation. However, some recent changes to the memory layout of WoW64 processes guarantee that this technique cannot be applied to the native NTDLL without some additional changes. As Alex Ionescu demonstrated in his blog, in recent Windows versions (starting from Windows 8.1 update 3), the native NTDLL has been relocated: instead of being loaded into the lower 4GB of the address space together with the rest of the process’ modules, it is now loaded to a much higher address. Figure 24 – base address of 64-bit NTDLL on Windows 10 (left) and Windows 7 (right). The rest of the address space above the 4GB boundary (with the exception of the native NTDLL and the native CFG bitmap) is protected with a SEC_NO_CHANGE VAD and thus cannot be accessed, allocated or freed by anyone. This means that the trampoline will always be allocated in the lower 4GB of the address space. Since the total user-mode address space in 64-bit systems is 128TB, the distance between the native NTDLL and the trampoline is bound to be much greater than 2GB. That makes the JMP emitted by most hooking engines inadequate. Figure 25 – illustration showing the control transfers required for inline hooks in WoW64 processes on Windows 8.1 and up. Note that in Windows 10 RS4 preview (build 17115) the SEC_NO_CHANGE VADs don’t seem to exist anymore and memory can be allocated anywhere in the process address space. This instruction performed well on Windows 10, and provided us with a way to instrument various native API functions in WoW64 processes. But when testing the modified code on earlier Windows versions such as Windows 8.1 and Windows 7, it failed to create the hooks entirely. 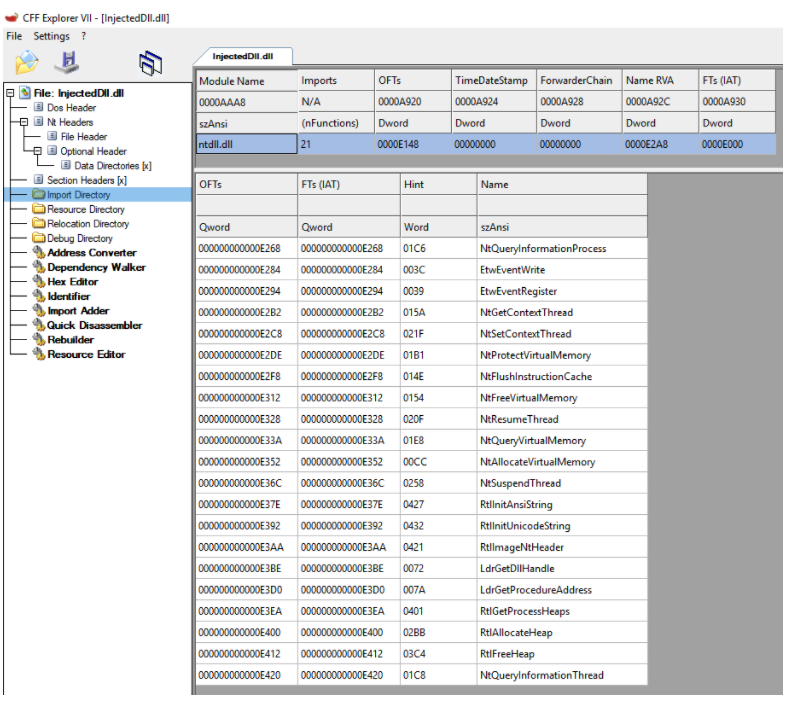 As it turns out, NTDLL functions in these Windows versions are shorter than their counterparts in Windows 10, and usually do not contain enough space to accommodate our chosen JMP instruction, which takes up 14 bytes. Figure 26 – implementation of ZwAllocateVirtualMemory() in Windows 10 RS2 (left) and Windows 8.1 (right). The reason this method works is because in x64 code the PUSH instruction, when supplied with a 4-byte operand, actually pushes an 8-byte value onto the stack. The upper 4 bytes are used as a sign extension, meaning that as long as the 4-byte address is not greater than 2GB, they will be zeroed. We then use a RET instruction, which pops an 8 byte address from the stack and jumps to it. Since we have just pushed the address of the trampoline to the top of the stack, that would be our return address. Figure 27 – NtAllocateVirtualMemory() containing our modified hook. Notice the first two instructions, which push the address of the trampoline into the stack and immediately “return” to it. There is only one problem left with this method, caused by CFG. As mentioned in part 2 of this series, all private memory allocations in WoW64 processes – including the trampolines used for our hooks – are marked exclusively in the WoW64 CFG bitmap. Whenever we wish to execute the original API function from the detour, we first need to call the trampoline in order to run that function’s prolog. But, if our DLL is compiled with CFG, it will attempt to validate the trampoline’s address against the native CFG bitmap before calling it. Due to this mismatch, the validation will fail, resulting in the termination of the process. The solution to this problem is rather straightforward – having control over the DLL’s configuration, we can simply compile it without enabling CFG. This is done by removing the /guard:cf flag from the compiler’s command line. 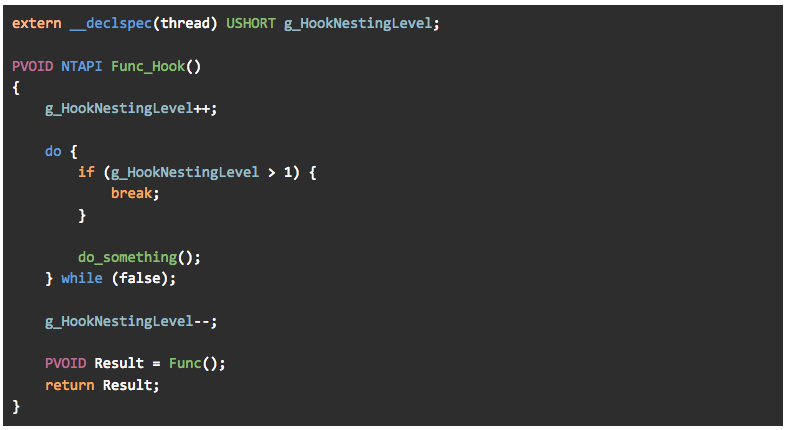 The last issue to consider when adapting a hooking engine is infinite recursions. After the hooks are placed, whenever a call is made to a hooked function, this call will reach our detour instead. But our detour functions also execute their own code, which might itself make calls to hooked functions, leading us back to our detour. Unless handled carefully, this can lead to infinite recursions. Implicit TLS (__declspec(thread)) relies heavily on the CRT, which is not available to us. Explicit TLS APIs (TlsAlloc() / TlsFree(), etc.) are implemented in their entirely in kernel32.dll, whose 64-bit version is not loaded into WoW64 processes. As it turns out, wow64.dll does not dynamically allocate TLS slots at runtime but rather uses hardcoded locations in the TlsSlots array accessible directly from the TEB (already instantiated on a per-thread basis). 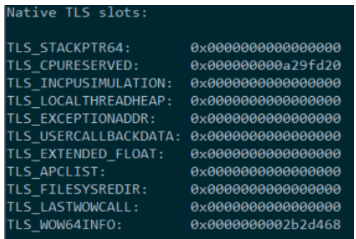 After some empirical testing, we discovered that most TLS slots in the 64-bit TEB are never used by WoW64 DLLs, so for the purpose of this PoC we can just pre-allocate one of them to store our counter. There is no guarantee that this slot will remain unused in future Windows versions, so production-grade solutions would probably look into some other available members of the TEB. Figure 32 – using an unused member of the TEB to count the “depth” of our recursion. This concludes the third and final part of our “Deep Hooks” series. 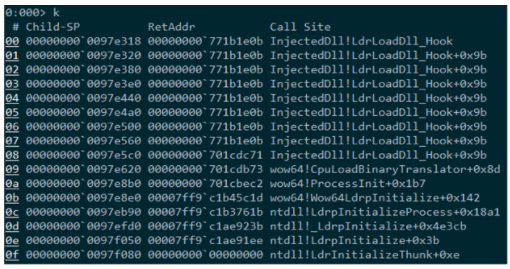 In these three posts we presented several different ways to inject a 64-bit DLL into a WoW64 process and then use it to hook API functions in the 64-bit NTDLL. Hopefully, this option would benefit security products by allowing them to gain better visibility into WoW64 processes and making them more resilient to bypasses such as “Heaven’s Gate”. The methods presented throughout this series still have their limitations, found in the form of new mitigation options such as dynamic code restrictions, CFG export suppression and code integrity guard. When enabled, these might prevent us from creating our hooks or thwart our injection altogether, but more on that in some future post. The post Deep Hooks: Monitoring native execution in WoW64 applications – Part 3 appeared first on SentinelOne. Freemium software is certainly nothing new. They are free apps that offer premium features if you don’t mind ads displaying while you’re using it or paying a small fee to have the ads removed. At least one company is trying a new business model on for size, albeit with limited success. The company is Qbix, and their freemium app is called “Calendar 2.” It’s a solid calendar app with more features than Apple’s default app, and the Qbix offers its users premium features if they’re willing to allow the company to make use of CPU cycles to mine cryptocurrency. 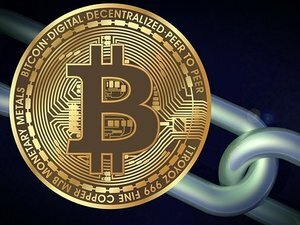 Hackers around the world have been enslaving the computers of unsuspecting users and using their processing power to mine cryptocurrency, all while making millions in the process. However, this is the first instance we’ve seen of a company attempting to bring the business model mainstream. For Apple’s part, the company seems to have no problem with the revenue scheme, provided that the offering company gets the consent of the user. Although given Calendar 2’s less-than-spectacular-success with the idea, the company may well change their Terms of Service to forbid it going forward.